When I first thought about how to make macadamia nut recipes, I just cannot go any farther than all those delicious cookie recipes. Have you ever had any products that you wish you had never tried simply because you can’t stop eating it? Well, the macadamia nut is one of mine. I love the flavor of it. If I can manage to keep them around long enough to use in baking, they have always gone in one of the many cookie recipes. I also have a problem refraining from eating cookies with this nut in the recipe. Years ago, my sister-in-law went on a vacation to Hawaii. When she returned all she talked about were those macadamia nuts which she ate while there. Hawaii is the world’s largest exporter of this nut so they were very plentiful. Jean went on and on about how good these are and how she was going to make macadamia nut recipes. My thought was while listening to my sister-in-law was that “it is just another nut”. I thought I had all the nuts I need to cook and bake with. I could not even remember seeing how to make macadamia nut recipes. What can be better than walnuts, pecans, peanuts, black walnuts etc? It was several years later when a friend brought me some freshly baked white chocolate macadamia nut cookies. Oh, my gosh! Those were so delicious and I was hooked! The macadamia nut has a rich buttery flavor and obviously high in fat. This adds to the flavor of macadamia nut recipes. I have read in many sources that this fat is a healthy monounsaturated fat. I have a hard time believing that anything that taste this good could be “healthy” but this is not the only healthy thing about this nut. It is high in protein (not as high as some of the other nuts) containing all the essential amino acids and some of the non essential ones. 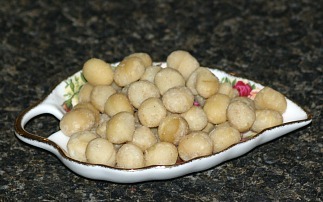 The macadamia nut is also high in fiber, antioxidants and minerals such as calcium, iron, magnesium, manganese and zinc. They contain some vitamin A and E and are rich in many important B complex vitamins. Like I said, I find it hard to believe that these tasty nuggets could be all that healthy! FOR SURE when you add the flour, sugar, chocolate chips, butter and other good stuff to macadamia nut recipes , they are even less healthy but Oh, so good. 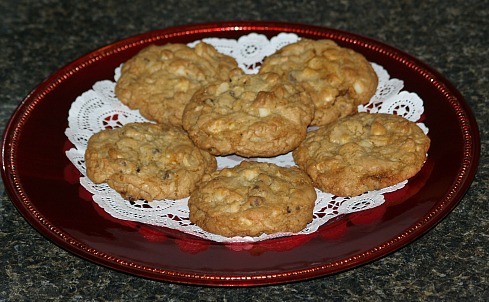 The first of my macadamia nut recipes, I found in my big box of clippings and I baked them for the first time. I believe this has to be my favorite chocolate chip cookie recipe now. I think this would make a great cookie to ship also; I will try to ship some the next time. Cream together butter and sugars; beat in eggs and vanilla. Combine flour, baking soda, white chocolate chips, semi sweet chocolate chips and nuts. 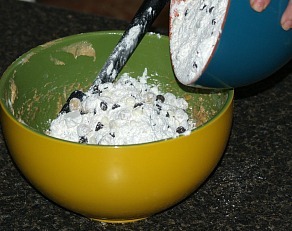 Combine dry ingredients with the creamed mixture and mix until blended. Measure dough in ¼ measuring cup for each cookie. Place cookies about 2 inches apart on ungreased baking sheet or parchment lined sheets. Bake about 18 minutes or until the centers are set and cookies are golden brown. Remove from pans and cool. 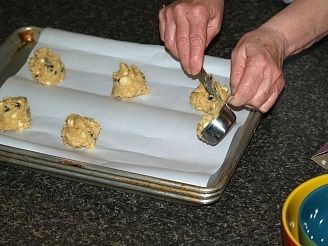 You can also use the above recipe and drop by teaspoonful onto baking sheet; bake ate 375F degrees for 8 to 10 minutes. 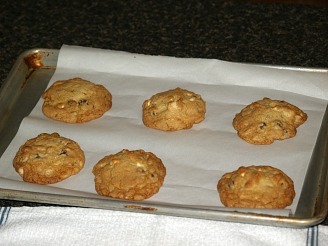 A mini variation can be made by substituting mini chocolate chips and chopped nuts. You can also use all white chocolate chips, milk chocolate chips or semi sweet chocolate chips. NOTE: I would cut back a little on the sugar if using all white chocolate chips or all milk chocolate chips. These contain more sugar and I think the cookies are a little too sweet. This delicious macadamia nut recipe is a perfect combination of orange. In a large mixing bowl stir together flour, powdered sugar and cornstarch. Using a pastry blender cut in the butter until crumbly; stir in nuts. Combine egg yolks, 1 tablespoon orange peel and 4 tablespoons of the juice. Add egg mixture to the flour mixture stirring until moistened; if needed add remaining juice. On a lightly floured surface knead dough into a ball. Shape dough into 1 ¼ inch balls; arrange balls on an ungreased baking sheet. Flatten each ball with the bottom of a glass to ¼ inch thickness dipping glass in granulated sugar. Bake for 12 to 15 minutes or until edges begin to brown. Remove from pan and cool completely on baking rack. Frost with orange frosting and garnish with shredded orange peel. Stir together 2 cups sifted powdered sugar, 3 tablespoons softened butter, 1 teaspoon finely shredded orange peel and enough orange juice to make spreading consistency. Preheat oven to 350F degrees; grease 10X15 inch jelly roll pan. For base beat butter and granulated sugar in a large bowl on medium speed until light. Beat in egg yolks and salt. Gradually add flour beating on low speed until well blended scraping down sides of bowl. Spread dough on prepared pan; bake 16 to 18 minutes until golden brown. For topping place flour and baking powder in a small bowl stirring to combine. Beat brown sugar and eggs in a large bowl with mixer on medium speed 2 to 3 minutes. Beat in vanilla; on low speed gradually beat in flour. Stir in the nuts and spread batter evenly over the hot crust; sprinkle with coconut. Return to oven and bake 20 to 22 minutes or until topping is golden brown. Remove pan to rack to cool; cut in bars. Preheat oven to 350F degrees; coat 9 X 13 inch baking pan with non stick spray. Whisk together in a large bowl the 2 cups flour, baking soda and salt. In another large bowl beat together the butter and sugar until fluffy. Beat in egg and vanilla; on low speed beat in flour mixture just to combine. Fold in 1 cup of nuts. Reserve ½ cup of dough and set aside. Press remaining dough with floured fingers over the bottom of a 9X13 inch baking pan. Spread the melted chocolate over the dough. 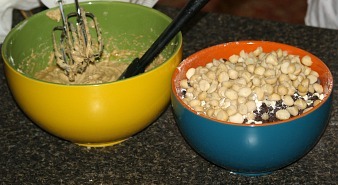 With hands, mix remaining nuts and 3 tablespoons flour into reserved ½ cup of dough. When mixture is crumbly, spread it evenly over the chocolate. Bake for 20 minutes or until golden brown; cool before cutting.